While audio isn't as good as the Google Home Max and it's a bit larger than the Mini, we're confident that the Google Home is the best Google Assistant smart speaker for most consumers. If you want a Google Assistant speaker that can be taken to the beach or on a hike, the JBL Link 20 is a clear winner. This speaker easily blends into any home environment and allows for easy multiroom pairing to other compatible audio products. This smart speaker has beauty and brains. Its sophisticated wood veneer adds character to any room, while the Google Assistant integration affords plenty of functionality. The Google Home Mini is great for people who want an unobtrusive, no-fuss Google Assistant smart speaker with excellent voice recognition. If you’re shopping around for a Google Assistant speaker, you’ve come to the right place. While nearly every wireless speaker grants access to your phone’s Google Assistant, these speakers actually integrate the software into it, meaning it directly contacts Google without needing an external device. Read on if you’re revving up to make your audio setup a little smarter. Editor’s note: this list was updated on March 5, 2019, to account for price changes. Related: What makes a great smart speaker? The Google Home may be the obvious choice for the best Google Assistant speaker, and that’s because it is. While our sister site DGiT points out it’s neither the best sounding Google smart speaker, nor the most compact, it’s quite good at nearly everything and deserves a spot on your mantle or kitchen counter. Its build makes it easy to swap out the base cap for a color of your choice, and you can even opt for metal bases. The design is simple and so is its operation. Controls use the touch-capacitive flat panel on top, including a microphone mute toggle, since you never know who’s listening. When the speaker debuted, it only allowed access to two Google accounts, but users can now connect up to six accounts to a single Google Home. What’s more, this Google Assistant speaker can recognize a specific person’s voice and contextualize a command. For instance, if you say, “How long will my drive to work take?” Google Assistant will look up your work address instead of your roommate’s. Users can string together up to three commands simultaneously for Google Assistant to execute. Although audio quality isn’t the best, users can easily connect to popular streaming services, a full list of which is here. If you happen to have an unsupported app, connect via Bluetooth and stream that way. Furthermore, Android TV and Chromecast users can operate everything via their voices with the Google Home, Google Home Max, or Google Home Mini, which is mentioned further down. This little Google Assistant speaker excels at handling multiple commands simultaneously, and it registers voices effectively, despite having just two far-field microphones—compared to the Amazon Echo and Echo Dot’s seven microphone array. If you need a Google Assistant speaker that does everything well and want to keep it affordable, this is a must-have. Users can make direct inquiries to a Google Assistant speaker and get immediate results without the need for a phone. Understanding how virtual assistants work can be overwhelming. 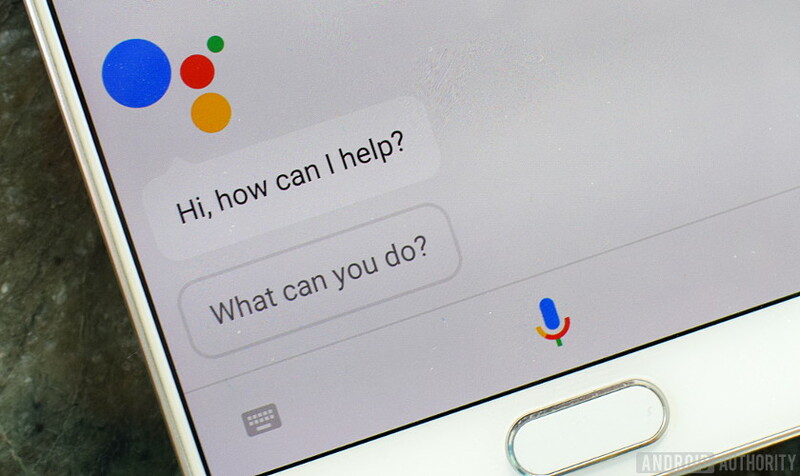 If you’re new to Google Assistant altogether, read our sister site Android Authority’s comprehensive guide. A Google Assistant speaker is one with Google Assistant integrated into it. Rather than communicating to your phone to have information relayed back to you, the speaker is its own source and connects to your Wi-Fi. Any given Google Assistant speaker supports a laundry list of services. Broadly speaking, these range from audio, smart home, photo and video, tasks, and gaming services. A full list can be found here. You can set routines with Google Assistant and make a slew of >commands like checking your alarms, getting a daily briefing, looking up random facts, and turning on your smart bulbs. Most of these speakers don’t support high-quality Bluetooth codecs because they require Wi-Fi for Google Assistant to function. By streaming audio over Wi-Fi, as opposed to Bluetooth, you’re experiencing better audio quality due to greater bandwidth availability. Because the speakers are software based, many of the features are identical like controlling smart home devices, streaming hi-res 24bit/96kHz audio via Chromecast, and connecting to other Chromecast devices for multiroom playback. Much like JBL’s other portable speakers, the Link 20 is IPX7 waterproof and is covered by a cloth wrap. The Link series separates itself from the Charge and Xtreme lineups by directly integrating Google Assistant. Therefore, the speaker allows for high-quality Wi-Fi audio streaming and multi-room support through Google Home. However, if you own other non-Link JBL speakers, you can’t connect them to the Link 20 via Connect or Connect+. This is a two-pound speaker can be taken anywhere, so long as your bag has room. It’s outfitted with a 6000mAh battery, which provides up to 10 hours of playback. While this is plenty to get through a full beach day, it takes a slow 4.5 hours to charge. The speaker comes in black or white and is lined with four circular LEDs that activate when Google is called on. You can access Assistant via your voice or by pressing the dedicated button on the top panel centered between playback controls. The same panel holds two opposing far-field microphones for effective voice recognition. The LG ThinQ WK7 is dressed in a sleek, cylindrical chassis appropriate for any home setting. It has Chromecast built-in, which means you can connect other audio products with Assistant integration for multi-room audio streaming. It isn’t limited to connecting with other smart speakers, though, as LG ThinQ technology is compatible with a host of smart home appliances and can control them via Google Assistant. Like all speakers with Google Assistant integration, the ThinQ WK7 allows for high-quality audio streaming over a Wi-Fi connection. It supports a host of file formats including OGG Vorbis, FLAC lossless, m4a, WAV, and MP3. Plus, Meridian Audio improves audio quality by producing a clear sound with emphasized bass response. It’s a great all-in-one solution for listeners who want seamless control of their smart home devices in an attractive, modern package. Klipsch’s The Three Google Assistant speaker houses two ¼-inch drivers and a 5.25-inch woofer with dual-opposed 5.25-inch passive radiators for an enveloping sound. It provides plenty of connectivity options for Wi-Fi, Bluetooth, 3.5mm aux, phono pre-amp, and USB Type-B, making it the most versatile option on the list as far as listening modes are concerned. Connecting via Bluetooth allows for lag-free, high-quality audio streaming as this is the only option that supports Qualcomm’s aptX codec. If you own other Google Assistant speakers, you can connect The Three to them via Google Home. What’s more, you can cast directly from your device to the speaker because it too has Chromecast built-in. Its elegant design has a real wood veneer with metal switches and knobs that look and feel sturdy. Although it’s the most expensive option listed, its cost may be justified by its functionality, versatility, and design. This mini smart speaker features a more attractive design than its Amazon counterpart. Its dual far-field microphone array effectively registers voices and executes commands with ease. The audio quality isn’t great, nor is it marketed as a selling point of the speaker, but it’s better than one may expect given its compact form. The Google Home Mini is meant to be smart first and a speaker second. It’s great for users who want something to help organize their day, read tasks, and control various smart home devices. You can also broadcast to other Google Home devices on your network. If you have a speaker in the kitchen and your kid has one in her room, you use Google Assistant to relay to your child’s speaker that dinner is ready. For less than $50, it really is the best Google Assistant speaker out there. Integration of Google Assistant into the JBL Link 300 is well implemented. Thanks to the dual, far-field microphone setup, the speaker is able to register hushed voices from a distance. JBL Link 300: The JBL Link 300 is a stationary Google Assistant speaker with a larger body and sound. It’s not waterproof like the Link 20, but that shouldn’t be an issue since it’s a homebody. Google Home Max: If you want big sound to fill a few rooms, the Google Home Max is the smart speaker to place on your mantle. This large, minimalistic speaker benefits from all the same Google Assistant features as the other picks while providing a loud house party sound. Google Home Hub: While this technically isn’t just a speaker, this smart display’s speakers are an improvement over the Home Mini and comparable to the Home. The SoundGuys daily grind consists of understanding audio from a comprehensive point of view. We approach our reviews, best lists, and features with the appreciation that audio is both objective and subjective. Some things like isolation performance and frequency response are measurable, but personal preference matters. Look, we get it; that not everyone wants studio sound, and there are plenty of great general consumer options out there. While all of this is well and good, we really just want you to enjoy your audio purchase, be it headphones, speakers, or earbuds. This site does operate via affiliate links; however, none of our writers will know if a link was ever clicked. Products are awarded on merit and effectiveness. To learn more, check out our ethics policy.